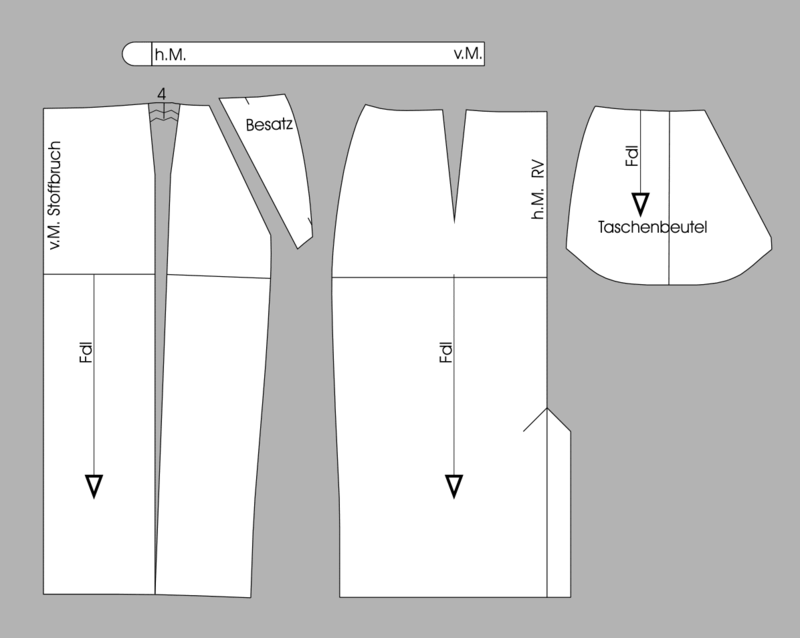 Use a straight skirt block in size 44 as a template (see measurement chart). 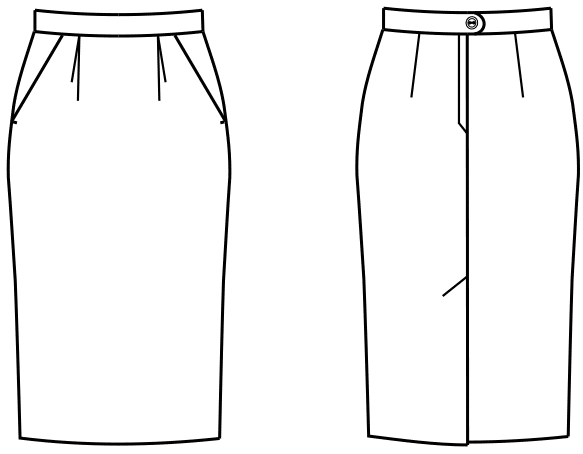 Draw the skirt 61.5 cm long. Taper each sideseam 1 cm at the hem and draw the new sideseam as illustrated. Shift the waist dart on the front pattern 2 cm to the front. Draw a cutting line for the pleat from the shifted dart to the hemline. Plot the slanted pocket entry and the pocket backing on the front pattern as shown in the illustration. Draw the pocket facing (here marked in grey). Mark the back vent at the centre back 24 cm long. Mark the zipper at the centre back. Plot a straight waistband 3 cm wide. Separate all pattern pieces. Trace a copy of the pocket backing and the pocket facing. Mirror the pocket backing at the fold. Slash and spread the front pattern at the waist to a 4-cm pleat. Fold the inverted pleat and blend the waistline. Blend the front hemline. Add the overlap and underlap to the back vent. Mark the grainlines. thanks for this English version site of Mueller und sohn. i have so far bought ‘Metric Pattern for Skirts and Trousers’, ‘Metric Pattern Cutting for Blouses and Dresses’ and ‘Fundamentals Menswear’. yet all these were bought for me by relations in Europe. I however want to purchase ‘Oktoberfest Dirndl’ but I’m in Ghana. how could I buy it?